Cultural and political differences between northern and southern California have long been part of the history of the state of California. Though divided between an anti-slavery north and a pro-slavery south from the moment it became a state, both the north and south practiced enslavement of Chinese, Black, Indigenous, and Latinx laborers. This legacy of oppression has consistently been accompanied, in both regions, by radical forms of resistance and movements against dominant forces. Poetry from the Bay Area and northern California has played a crucial role in the history of poetry in the U.S., while the poetry of southern California has remained much less well known. This group reading features poets living around the state whose work has been influenced by very different, and often conflicting, literary, cultural, and political visions of California, visions that reflect, in ways that are uniquely Californian, some of the same cultural and political divides currently causing so much national conflict. 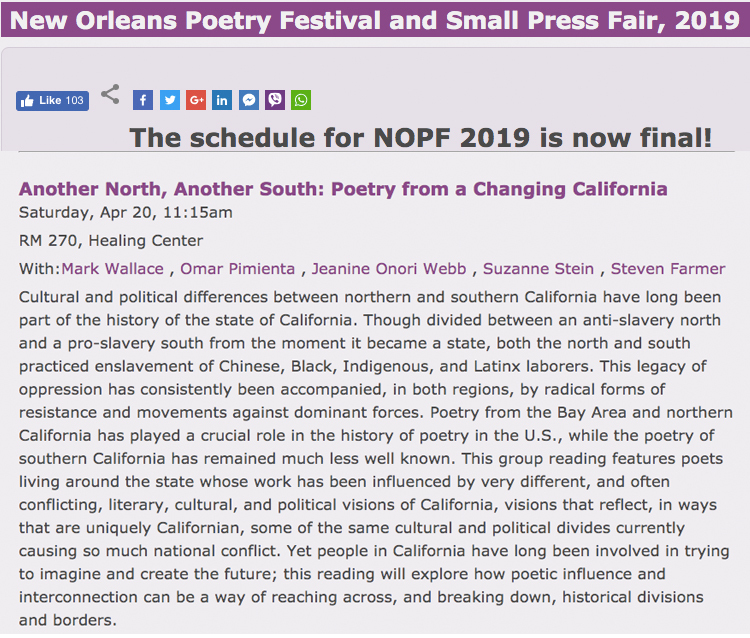 Yet people in California have long been involved in trying to imagine and create the future; this reading will explore how poetic influence and interconnection can be a way of reaching across, and breaking down, historical divisions and borders.